Combining the national grids in a network structure. High-Voltage Direct Current (HV-DC) is feeding the national grid with high voltage Alternating Current (AC). Renewable electricity is our common future for our energy need. The production areas are not the same as the consumption areas. Therefore electricity will be transported over long distances. This is already the fact with long-distance high-voltage direct current (HV-DC) lines between two countries. New is a grid stucture which combines national grids in a web structure similar to the internet. It combines the renewable production with hydropower and natural-gas powered electricity production stations. The HV-DC cables come together in strong nodes. One of them is on the Dogger Bank. 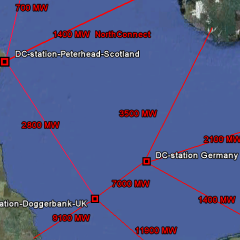 From the Dogger Bank node the electricity can be directed to different directions. Electricity will mainly flow from north (low price) to south (high price). It can supply the UK, Netherlands and Germany from Scotland and Norway. It by-passes the area of North-Germany. It makes use of the excisting grids and also in combines the planned HV-DC lines across northern Europe. It can be build modular with single 700 MW HV-DC lines accross the nodes. This will speed up the building process. It will release the electricity in the future for Scotland and allows unprecedented renewable energy growth in high-wind areas like northern Scotland. It contributes economically to remote areas in northern Scotland and the Scottish islands. HV-DC lines are extremely profitable if the price difference for electricity (Mega Watt hour) is high between production and consumption areas. The electricity network can be financed by commercial bank loans while subsidising is not needed.